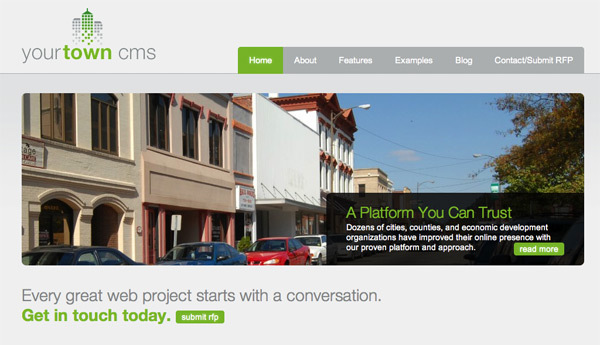 We recently built a mobile website for YourTown CMS in partnership with Liaison Design Group. We've had increasing demand for mobile web development lately, and we're particularly excited to show off our success on the YourTown CMS mobile website. We were inspired by an example we saw in "Mobile First Web Design" recently released by Luke Wroblewski through A Book Apart. A simple "Navigation" hyperlink resides at the top right corner of each page. When you click the link, the page whooshes upwards revealing the site navigation. 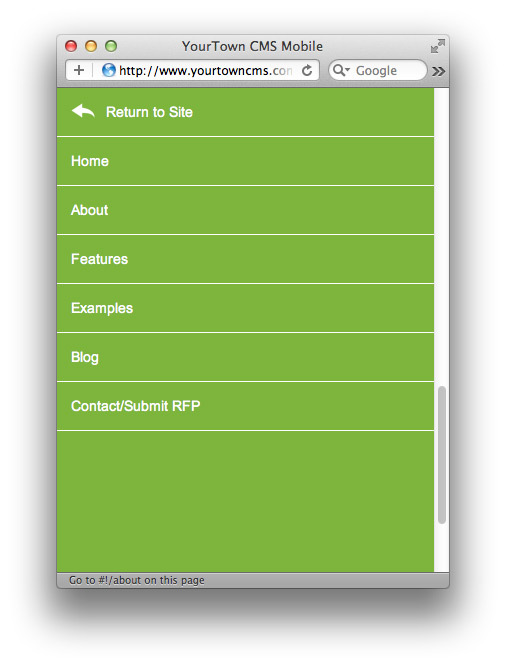 The navigation links allow you to jump to another page or return to the current page. It's a simple but effective — and really cool — way to implement mobile website navigation while still keeping content front and center. 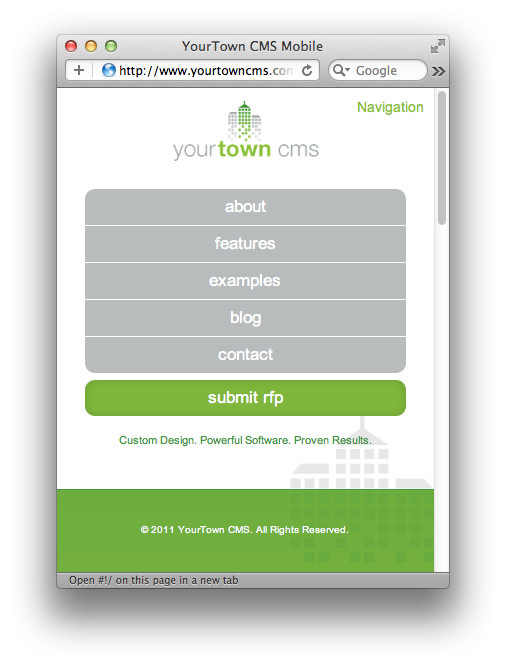 Here are a few screenshots of the YourTown CMS mobile website. The answer to that question is worthy of a whole post! I'll try to answer quickly as best as I can. The upside to using a responsive technique is that you're serving everybody the same markup and styling it to match their device screen size. This potentially simplifies things as you only have one markup base to deal with. It also creates complications. Your markup will often contain things that simply aren't needed in a mobile context or things like desktop-sized images that require additional cleverness to deal with. Also, when it comes to maintaining a site, you need to keep ALL resolutions in mind when you make markup adjustments because they will cascade everywhere. 1. We knew our visitors would be using dominant mobile platforms, not long tail ones. We could count on mobile webkit. 2. We built it on HiFi which made all of the content available through a simple API. What this means is not that we've developed a separate mobile site. We DON'T believe that is a good approach. What we've done is developed a mobile version of the site that doesn't intersect with the desktop version at the markup, it instead intersects at the CMS. It's not mobile-first responsive web design; it's content first web design. The net result of using this method is a site that will perform dramatically better on a modern phone than a responsive design reasonably could. On first load you download the minimal template information and on every other page request you are simply downloading JSON content. This makes it FAST. It also makes it super simple to develop for. That's just scratching the surface of the issue. Responsive web design is great, but unless you are up-to-the-minute on best practices and follow through on every one of them, you're going to put out a bad product. http://hicksdesign.co.uk/ sends my phone almost 3MB. Mobile applications are now very important for any business, using it, they can reach their right customers. but there are very few companies that provides Mobile application provider companies, 4 way technologies is one of them. they are also good as Top IOS Application Development company.